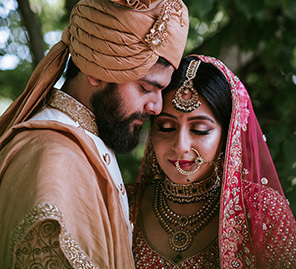 Anisha and Milan's hip and lively destination wedding was hosted at Florida's Fontainebleau Miami Beach resort which offered stunning views and elegant venues . 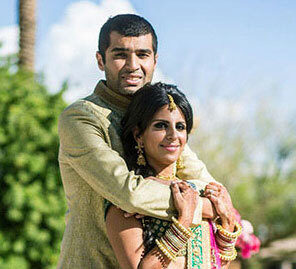 Anisha and Milan were clear that they wanted a destination wedding. So they planned their Miami wedding in a beautiful location and made the venues come alive with beautiful floral decor. 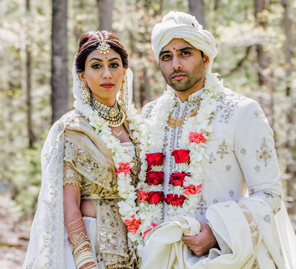 Check out the highlights and photos below shared by bride Anisha. ““All our wedding shopping was done in Mumbai. Our Sangeet outfits were Falguni Shane Peacock & Shantanu and Nikhil. Milan’s wedding outfit was from Sabyasaachi and mine was from Jade by MK. My reception outfit was from Manish Malhotra’s store in Bombay and Milan actually custom made his Tux here in Philadelphia from My Suit. My jewellery was also custom made in Ahmedabad. 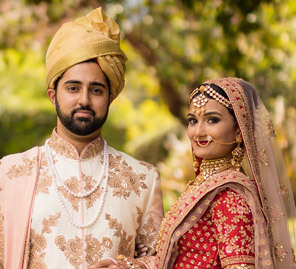 Groomsmen and Bridesmaids outfits were all custom made in Ahmedabad. “We hosted the sangeet function a night before the wedding ceremony. It was an outdoor event, and we chose the Ocean Lawn as the venue.” Elegant decor elements added to the magic of the night which saw guests dance, sing and enjoy the well-planned event. “Our December 1st wedding took place outdoors on a terrace overlooking the ocean,” shares Anisha. The day started with her getting ready for the religious ceremony. Milan arrived looking like a royal groom in a white and gold sherwani. Blush and cream hues alongside floral arrangements set the tone for the gorgeous nuptials. Fresh flowers comprised the main decor element which made the entire venue look dreamy. The couple was surrounded by close family and friends who showered the newlyweds with their blessings. The beautiful ballroom of the property lent this elegant function a glamorous vibe. White drapes, blush blooms, beautiful table set-up, chandeliers were some of the decor highlights. White florals and candelabras added a glow to the proceedings.